This church, built in 1928, is neither the first nor the last to serve the congregation of Gap Creek Baptist in Marietta. The church’s history dates to 1840 and includes a bitter matrimonial conflict that nearly shuttered the organization. When Gap Creek Baptist formed, members worshiped in a simple log cabin along its namesake creek not far from its current location. Two decades later, in 1859, local resident Champion Osborne donated two acres of land for the construction of a new sanctuary. His wife Laurcatte, however, was furious. 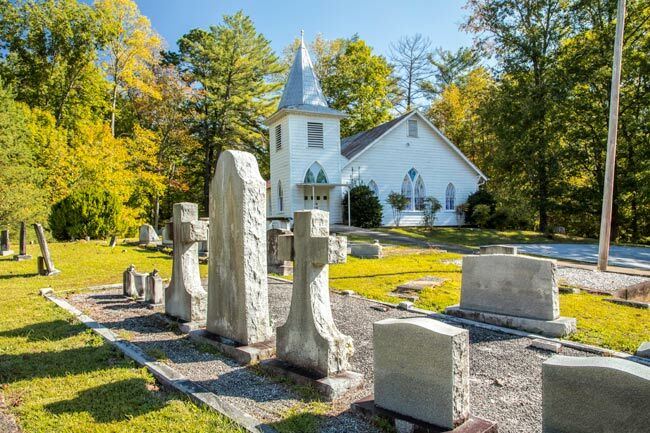 Nonetheless a new log church was built where the congregation’s graveyard currently sits, and a road was cut leading to the site. Champion died soon after the new church was finished, and Laurcatte tried to prohibit members from entering the church property – one of her relatives even helped her block the road. Members cut a new road to the church, and a resulting lawsuit ruled in favor of the congregation. Unfortunately the ruling did not come until 1870, and the second church had burned two years earlier, in 1868. Around the beginning of the twentieth century the third church was supplanted with a frame building, which lasted until 1928 when this charming sanctuary with its elegant stained glass imported from France was constructed. Gap Creek Baptist’s membership had increased greatly, and a larger church was warranted. Businessman John Hart from Spartanburg, who had spent his formative years in the area, was instrumental in securing the funds for the new church. He is interred within the churchyard. This sanctuary served the congregation of Gap Creek Baptist Church until recent years, when a larger, more contemporary church was desired to accommodate an ever-increasing membership. In 2008, the first worship service was held on Easter Sunday in the present building, which sits across the street from the former church and graveyard. The congregation still uses the older church from time to time.